Home Page Interview with Author Can You Help? A trained chef too, Dr. Felder knows what he is talking about when it comes to food and being healthy. He says by following this diet plan, not only can you add 6.4 years to your life for men, and 4.6 years for women, you can reduce your risk for developing heart disease by 76%. Dr. Felder prescribes seven foods, the foundation of the Bonus Years Diet, which are necessary to prolong good health. He says “You may be surprised to learn that diet and lifestyle can have twice the impact of preventing heart disease than simply taking drugs”. Amazing! Each of the seven ingredients has a job it does to help us stay healthy and they are clearly explained in the book. This is not a weight loss diet but by eating healthily, chances are you could drop a few pounds. 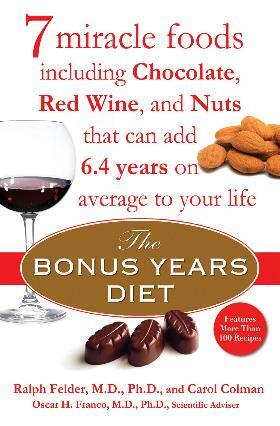 Dr. Felder (and Dr. Franco, who initially came up with the seven foods) also talks about the Bonus Compatible Foods in chapter 5 – foods that complement the Bonus Years Foods - so you don’t have to live on the same seven foods for the rest of your life. He’s also given us many recipes to choose from, as well as menus (30 day’s worth of meals and snacks) to work into our lives. Recipes include Pan-Roasted Pork Tenderloins with Apple; Salsa Snapper; Chocolate Mousse; Velvet Chicken; Italian Potato Salad, and Ice Cream with Chocolate-Peanut Butter Sauce. Who says eating healthily has to be boring? Make sure you continue to eliminate trans fat and saturated fats from your diet. Nutritional guides are included with all recipes. We’re also given foods with which to stock our pantry, as well as Cooking Techniques from the Dr. Chef. Conclusion - This book could very well revolutionize the way we feel about our health and could reduce the amount of drugs we take as a nation. "The bonus years diet is an inclusive not exclusive diet, emphasizing what should be eaten to ensure health rather than what needs to be avoided. The diet is an elegant synthesis of the heart and vascular research over the past twenty five years--using the same principles that doctors use to prescribe drugs." Ralph Felder, M.D.,Ph.D. Interview with Author Can You Help?